All number one ranking artists in the monthly video channels will receive a $100 Amazon.com* Gift Card**. Enter your best original music video into the Rock, Hard Rock, Hip Hop, Pop, or Country video channels for your chance to win. 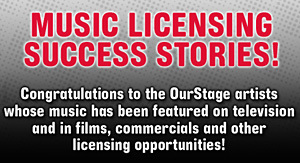 For more information on OurStage's monthly competitions visit the FAQ. *Amazon.com is not a sponsor of this promotion. Amazon, Amazon.com, the Amazon.com logo, the Amazon Gift Cards logo, and 1-Click are trademarks of Amazon.com, Inc. or its affiliates. ** Amazon.com Gift Cards (GCs) may be used only to purchase eligible goods on Amazon.com or its affiliated website Endless.com. GCs cannot be redeemed for purchases of gift cards. Purchases are deducted from the GC balance. To redeem or view a GC balance, visit Your Account on Amazon.com. Except as required by law, GCs cannot be reloaded, resold, transferred for value, redeemed for cash or applied to any other account. Amazon is not responsible if a GC is lost, stolen, destroyed or used without permission. See www.amazon.com/gc-legal for complete terms, restrictions and exceptions. GC's are issued and 2011 by ACI Gift Cards, Inc., a Washington company. "Submit Your Short Film, Music Video, or Game Trailer and Win Over $5,000 in Prizes!" Enter The "Tr3s Latin Music Channel" For A Chance To Become El Headliner! Alternative Country Artists, Win A Year’s Supply of Free Strings & Accessories From Ernie Ball!